Since the first world war (WWI), autism rates for new primary school students have been roughly doubling every ten years (click here to see one of many similar graphs available online from around the world). We know from records that behaviours and attributes we now call autistic have been recognized throughout written history. From renowned leaders such as Leonardo da Vinci and Hildegard of Bingen, right through to the village mutes — who nevertheless led full and fulfilling lives — autistics were there. One of the prevalent theories among those of us with autism is that over that span of time social life has become a lot more complex, and the pace of change has become a lot more rapid. The autistic ways of perceiving and interacting may have fit better in eras prior to WWI. However, this theory doesn’t explain that the degree of challenges for those of us with autism has also risen from my Grandmother’s time. Those of us with autistic ways of being are a lot less healthy and functional than we used to be, 3 to 6 generations ago, when most of us were merely eccentric! The degrees of pathology (digestive, immune, toxicity, stress/trauma, nervous system) keep going up in severity. Assuming that the rate-increase nay-sayers have their heads in the sand, let’s take a look at what the health research can tell us. First, I’m going to assume that you’ve read my Five Root Causes of Autism Challenges report, or seen the webinar. In both of these, I outline the accumulated data indicating that autism challenges result from unaddressed health issues, and that the autistic acultural attributes result from high stress during key developmental stages — an adaptive response to stress which produces people focused on problem-solving, and creating beauty, rather than on socializing. Why would the degree of autistic pathology or challenges be increasing so rapidly? The answer lies in an ecology concept called “Range of Tolerance”. On the simplest level, think of Goldilocks. She instinctively knew when something was too hot, or too soft (though the offended bears were more of a threat than cold porridge). And she knew when something was just right. On a more complex level, sea-coast dwellers have trouble in mountainous regions, because the amount of oxygen they’re accustomed to just isn’t available in high altitudes. Sea-coast dwellers find mountain air “too thin” or oxygen-deficient, whereas mountain-dwellers with larger lungs and deeper breathing patterns find mountain air “just right”. But let me give you an example from a choice people make every day. How much protein should we eat? Please leave aside whether it’s plant or animal sourced (and sorry about the photo if you are vegetarian… I was trying to make a point). We humans are designed to do well on a certain amount of protein. Go much over that, and disease sets in. Go much under that, and disease sets in. Be off just a little, one way or another, and your body doesn’t function optimally. Be off by too much, and you die. There’s variability, of course, starting with genes and ending with lifestyle. If we expend more physical effort, we need more protein. If we are healing, our protein needs also go up. If our activity and stress levels drop, we need less protein than we’re accustomed to, and have trouble if we try to keep eating our former amounts. However, despite variability, what amounts are good for us, and what amounts are too much or too little, are very similar for all of us humans. 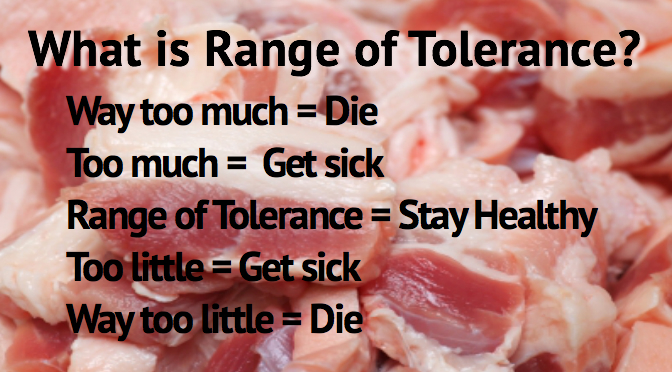 Our bodies have ranges of tolerance for thousands of aspects of our lifestyles. Taking meat for an example again, it’s not just the amount of protein in it to pay attention to. It’s the B vitamins, or the agricultural toxins, or the antibiotics, or a myriad of other things that may be present inside, or outside, our optimal ranges of tolerance for each of them. What’s in our air that we need, or that harms us? What’s in our beverages? What’s in our foods? What’s in our clothing, shelter, care-products, and medicines? What kinds of electromagnetic signals are present to disrupt our cell communication, and how vulnerable are we to that disruption? The reality is that since the cash-strapped Allied Countries were arm-twisted into finding peacetime uses for the toxins that killed soldiers in WWI trenches, and the factories that mass-produced WWI weapons, our daily lives have gone further and further away from the many specific ranges of tolerance that keep us healthy, keep our seniors able, and keep our babies thriving. Current global socio-economic drivers are expecting us to keep stepping further and further outside of the lifestyles that sustain us. Stress can only go on so long before systems start failing, and some of us (like those of us with autism) are much more vulnerable than others. The thing is, stress is cumulative. When that happens, you could say you were blind-sided. But hundreds of little aspects of your life and health weren’t as good as you’ve known they could be. They have been adding up over time. How much of what you don’t like about your health have you been mistakenly attributing to inevitable aging? Back to autism. What we know is that when we identify which of the five flavours of stress that cause autism challenges are involved, for any one particular individual with autism, and to what degree they’re involved, we can begin to alleviate those challenges by addressing that blend of stressors effectively. When stressors are effectively addressed, sometimes some of those autism challenges can disappear altogether. You lift the stressors, and the strengths of the autistic person underneath become increasingly evident and available to integrate in daily activities, and contribute. Will autism disappear? Unlikely. Mums and tots will always experience some degree of stress, and the higher the stress, the more likely the brain of a scientist or artist will be shaped by that stress… As long as we stay within our optimal ranges of tolerance, however, we can minimize or eliminate the pathologies that are crippling so many of our efforts to engage and contribute as autistics! If you would like your home, classroom, or workplace to stop aggravating (or creating) autism challenges, and instead support autistic learning and health recovery, you can make it so in 6 weeks with my Assess, Adapt, and Achieve program. If you would like to help an autistic to create a lifestyle that dodges the pitfalls, and optimizes that person’s gifts, check out the 12-week Reach For Potential program.